Scott Glosserman walked out of the meeting dazed. Whatever he had been expecting, it hadn’t been that. TRACK BEFORE: Flex your fan muscles at gathr.us and keep track of funding for Before the Mask via kickstarter.com. Anchor Bay had distributed Glosserman’s debut film Behind the Mask, securing it a theatrical run and then handling its DVD release where it quickly became a sizable hit. The film, which had been independently financed by Glosserman’s family and friends, was in many ways ahead of its time. It was a mock documentary made after The Blair Witch Project, but before Paranormal Activity turned the found-footage movie into the preferred flavor of horror for the studios. Behind the Mask followed a crew as they documented would-be slasher icon Leslie Vernon as he prepared and trained for the killing spree that would put his name next to the likes of Michael Myers, Freddie Krueger, Jason Voorhes, and all the rest. The film played like any number of documentaries about a young, dedicated, slightly off person attempting to achieve an odd goal—the only difference is that goal was the slaughter of a dozen or so innocents. Think Christopher Guest does Friday the Thirteenth. Behind the Mask was funny but brutal, ultra horror literate (the film featured sharp ribbings of genre conventions and supporting roles from horror icons like Robert Englund, Zelda Rubenstein, and Scott Wilson), but fast paced and snappy enough for the casual fan. And it had sold more than a quarter of a million copies. At the end of the film, Leslie Vernon, in the time-honored tradition of slashers everywhere, rose from the grave, seemingly ready and raring for a second round. Glosserman’s second feature was cancelled when the company financing it abruptly went bankrupt. Tired of being offered “Cabin Fever rip offs about people who spontaneously combust,” Glosserman returned to Anchor Bay to pitch a sequel to the cult favorite—and was turned down flat. Flat flat. As in told that the company wouldn’t even consider distributing the film if Glosserman paid them a fee. Of course, time had changed things for both Glosserman and Anchor Bay since the release of the first film. In the interim, Glosserman worked on documentaries and television, and Anchor Bay lost its way. During the DVD boom, Anchor Bay had been one of the most respected brands on the market. It not only provided a platform for independent horror films like Glosserman’s and those of fellow indie horror icon Adam Green, but it also offered the best in esoteric cinema. It released films of all genres, both contemporary and classic—its Mario Bava boxsets and releases of Dawn of the Dead and Suspiria are a gold standard—and foreign films. (It handled Herzog’s back catalog on DVD.) The company had even performed a minor cinematic miracle in landing an official release for the films of Alejandro Jodorowsky, which had heretofore been considered about as likely as the Loch Ness monster and Sasquatch starting a Jackson Browne cover band. Trouble started when Anchor Bay was acquired by Starz Media and then used primarily as a distributor of the now defunct studio, Overture. Whatever the reason, a voice that had served as a haven for independent horror was no longer interested in doing so. Glosserman, who had experienced mainstream studio “development hell” before, didn’t even bother pitching the film to other studios. “Anchor Bay had all the data on the first film, not to mention the property itself, to bundle with the second. … They were my best shot,” he said. Glosserman found himself in the position of far too many independent filmmakers. It’s an odd time for horror, and for every filmmaker like Ti West who manages to find enough funding to consistently make films, there seem to be a dozen like Glosserman, Michael Dougherty, and Bryan Bertano whose singular sensibilities are perceived as risky a bet as remaking a 30-year-old property people only half remember. Studio backing itself is no guarantee, either; this year’s sleeper hit Cabin in the Woods spent two years on the shelf, held by a company that had no idea what to do with it. A similar fate befell the now cult favorite Trick ‘R Treat, which was eventually given an ignominious direct-to-DVD release. Glosserman’s idea was without a home or means of production, and there was no clear way forward despite the commercial success of his debut film, despite the thousands of dedicated fans. Danny Foster was one of those fans. He had picked up Behind the Mask on a blind buy on its initial release and had promptly fallen in love. Foster bought Behind the Mask posters, shirts, and as many different formats of the film as he could get. As of this writing, he also owns a copy of Paradise Lost signed by the cast (see the movie, and you’ll understand), a copy of the film signed by Glosserman, and even one of the scythes Leslie uses in the film (signed by Nathan Baesel, who plays the titular character). As a result, he was in Los Angeles in May 2011 at the Weekend of Horrors Convention, when director Glosserman and star Baesel announced they would attempt to make a sequel to Behind the Mask titled Before the Mask, and in lieu of studio support they would be seeking financing from the fans themselves. Eschewing fundraising websites like Kickstarter and Indiegogo (which take roughly 10 percent of raised funds), Glosserman originally attempted to raise funds through Facebook, setting up a page that offered everything from preorderable DVDs of the unmade film to cameo parts as one of Vernon’s victims. The campaign raised about $75,000—an impressive number, but not nearly enough to start production. Foster was among the first to sign up and preorder his copy of the film. He helped spread the word to help fundraising efforts for the film. The effort went so far as to auction off props from the original film and other pieces of horror memorabilia; Foster himself donated his own copy of His Name was Jason, a documentary about the Friday the 13th franchise which he had signed by every person to don the hockey mask. Then he waited, and waited … and waited. Until March 2012, when Foster was given the opportunity to do something more than wait. Let’s say you’re reading about the latest indie films coming out of SXSW, Fantastic Fest, or Sundance—smart, challenging, fun films that promise you an alternative to the usual content clogging up the multiplex. Or let’s say you’re reading about the revival scene in a hub like Austin or Los Angeles—true classics, films with grit and style. Or just plain esoteric and bizarre. Holy crap, did you see what the New Beverly is playing this month? Let’s say you had the opportunity to do something about that. Enter Gathr, the website that makes you a programmer and, in the case of Before the Mask, a financier. Glosserman came up with idea as he researched crowdsourced financing for Before the Mask. The concept is simple. The Gathr website offers a list of titles, everything from established studio classics like The African Queen to recent indies like Shame, from films as overlooked as the seemingly cursed Margaret to projects as widely seen as Avatar. There’s nostalgic comfort food like The Princess Bride and The Sandlot and abrasive cult films like Oldboy and Suspiria and grindhouse classics as disreputable as Death Race 2000. There are documentaries, foreign films, even films that never played in the theaters at all, like Trey Parker and Matt Stone’s Troma debut Cannibal the Musical, or the modern-day black-and-white silent versions of Call of Cthulu and Whisperer in the Dark made by The HP Lovecraft Historical society. Gathr offers you the chance to have any of these films play at your local theater. The only catch is that you have to prove there’s an audience for them. The response from the studios has been enthusiastic, with Glosserman recently gaining access to the Fox archives and Janus Films, the company behind the Criterion collection, giving him an impressive catalog. “The question is whether audiences will adopt this new way of ‘pulling’ movies to their areas,” Glosserman said. This puts an unprecedented amount of power in the moviegoers’ hands. Of all of the many undemocratic aspects of the film industry, distribution has always been the most solid from the top down. People above you dictate what you get to see in theaters, and there’s very little you get to do about it. This isn’t so much the result of some evil conspiracy as it is the simple facts of the pressures of the film business. Distributing a film is always a gamble, and, as one sage put it, no one ever went broke underestimating the intelligence of the American Public. The films that end up in major theaters are the ones that provide the least risk. Normally those are the ones that hit smack dab in the middle of the lowest common denominator. This model is getting subverted in a big way for the first time, giving all of us bitchy film fans the chance to put our money where our mouths have been for so long. You want Beasts of the Southern Wild or John Dies at the End to open in the same amount of theaters as The Avengers did? With an organized enough group of fans, you can make it happen. There is literally no limit to how big of a game changer this concept could be. In the case of Behind the Mask, pulling the film into a theater not only allows it to be seen, but gives a stream of funding to Before the Mask as well; every dollar made at a Behind the Mask screening goes towards making Before the Mask a reality—a model Glosserman says would work for future films as well. Of course, the question is: Will people get behind it? In an era of film on demand and instant streaming, where the idea of movies as a communal experience becomes more and more endangered, is the idea of getting people to not merely leave their house, but working for it simply unrealistic? In the first 48 hours, there were more than 115 requests for screenings of Behind the Mask, but only a fraction of those were able to “tip” and sell the required amount of tickets to secure an actual screening. Perhaps Glosserman is in the same position he was in with his own film five years ago, just too far ahead of the curve to ride the wave he foresaw. Gathr requires an engaged, active audience, not a passive one, and despite the ubiquity of social networking, it still needs someone to get the ball rolling. Foster laughs, but he hadn’t been the first to try to bring Behind the Mask to SLO. Determined to get the film to play, Foster went into salesman mode. As a member of the band Society’s Child, he knew a little something about the difficulties of self promotion. 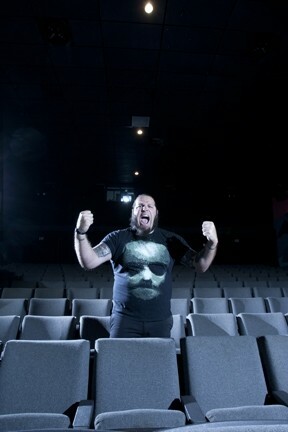 Going into battle, Foster began promoting his screening at his own shows, and at local screenings of The Rocky Horror Picture Show and amateur wrestling shows where his band plays. “Basically you have this combination of punk kids, Rocky Horror guys, and wrestlers supporting our screenings. It was a pretty motley crew,” he said with a chuckle. He even went so far as to get Robert Englund—that’s Freddy Krueger to you—who plays a supporting role as Vernon’s own personal Van Helsing, to promote the screening on a local radio program called Jeff and Jeremy in the Morning. Foster’s hard work paid off, and the screening tipped where so many others failed. The film played to a packed house at the Downtown Centre Cinema, and Glosserman and crew came out to support it. If the first screening of Behind the Mask was a surprise, the second, which took place June 27, was a downright shock, a show of dedication and activity in the fan community that was just unexpected. It was a demonstration that Gathr need not be a fluke or the result of one person hustling, that it could become an entrenched part of the system and create real and lasting change and opportunity. At present, the same forces are trying to stage a third screening, and anyone at any time can go to Gathr and initiate it, bringing it and the film it supports one step closer to existence. Though the long term viability of Gathr remains to be seen, it’s no longer the only source of funding for Before the Mask. A little more than a year after it was first announced, Glosserman opened a Before the Mask Kickstarter project, relying on the very kind of entrenched crowdsourcing apparatus he had tried so hard to avoid. Though the Gathr screenings have been successful and continue, time constraints have forced Glosserman and company to go for more direct sources of financing in a last-ditch effort to fund the project. Under the rules of Kickstarter, the production of Before the Mask will have until Aug. 9 to raise the $450,000 needed to complete the film’s budget. It’s an all-or-nothing proposition. Whether Leslie Vernon will don the mask again, and Glosserman’s ambitious vision of fan-funded horror will come true, remains to be seen. As of this writing, $162,246 have been raised. as the game changer it has the potential to be, or merely exist as a could-have-been cul de sac, remains to be seen. The choice, for once, is up to you. Bryce Wilson is a New Times contributor currently residing in Austin, Texas. Send comments via Managing Editor Ashley Schwellenbach at aschwellenbach@newtimesslo.com.